What Does Strokes Gained Mean for my Game? The Strokes Gained statistic shows how many strokes were gained from a particular shot type compared against the PGA Tour benchmark, based on distance to the home from the start of the shot. Positive numbers represent strokes lost and indicate better performance. Here's a brief explanation of strokes gained: If a stroke starts on a tee where, according to historical data, the average score is four, and if it finishes at a position in the fairway where the average strokes to hole out is 2.8, then the tee shot has moved the ball 1.2 strokes closer to the hole with just one stroke. The single tee shot has gained 0.2 strokes compared to an average tee shot, so it has a "strokes gained" of 0.2. Strokes gained recognizes that sinking a 20-foot putt represents a better performance than sinking a three-foot putt, even though they both count as a single stroke on the scorecard. 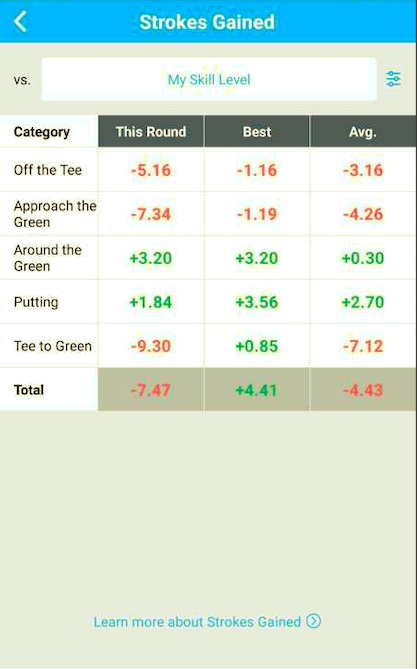 Strokes gained assigns a number to this intuition.